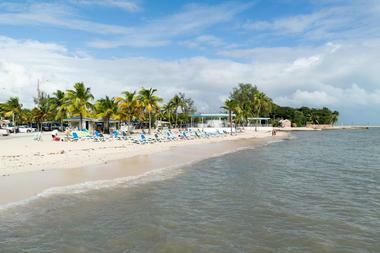 Key West is a very popular tourist destination especially during the winter. At this time the city can be quite crowded and the hotel room rates are high, but many visitors come here to enjoy the warmth and sunshine. There are fewer tourists during the summer months and this means less crowds and lower room rates. However, the summer months are rainy and humid and hurricane season is between June and November. 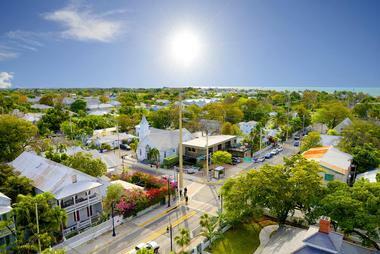 The best time to visit Key West is during the spring months between March and May. The winter crowds leave; hotel rates are affordable; and the weather is warm and pleasant. January is the last month of winter in Key West and the coldest month of the year. The average high temperature will peak at 74°F (24°C) while the average low temperature will hit a maximum of 64°F (18°C). In February, Key West sees the lowest precipitation rate in the entire year with just under 2 inches (38 mm) of rain to be expected. The average high temperature and average low temperature increases by two degrees to 76°F (24°C) and 66°F (19°C) respectively. 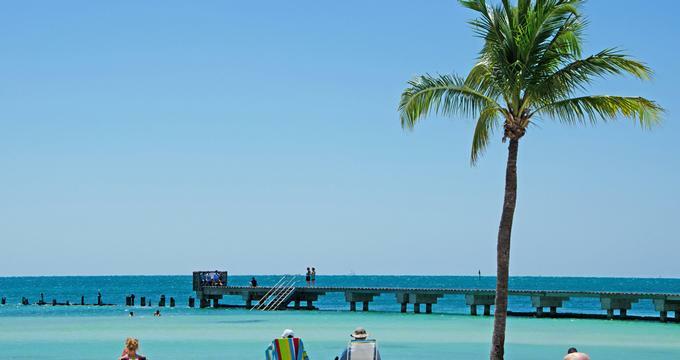 Key West Weather in March: The weather in March increases again by another two degrees resulting in an average high temperature of 78°F (26°C) and an average low temperature of 68°F (20°C). April brings an average high temperature of 81°F (27°C) as spring continues in Key West. Low temperature averages are 72°F (22°C). In May, the last month of spring, the temperatures jump up with the average high and average low temperatures ranging between 85°F (29°C) and 76°F (24°C). Key West Weather in June: As summer kicks off in June, the average high temperature spikes to 88°F (31°C). The average low temperature also makes a jump to 79°F (26°C). July is the hottest month of the year as the average high temperature increases to 89°F (32°C). Likewise, the average low temperature hits an annual high of 80°F (27°C). In August, the average high and average low temperatures hold steady at 89°F (32°C) and 80°F (26°C) respectively, tying with July as one of the hottest months of the year. The only difference between the two months is that August has the second highest precipitation rate in the month at 5 inches (137 mm). Key West Weather in September: The highest precipitation rate of the year goes to September with a whopping 7 inches (170 mm) of rainfall expected. The average high temperature decreases a single degree while the average low temperature goes down to 78°F (26°C). October sees cooler temperatures with the average high temperature decreasing to 85°F (29°C). The average low temperature decreases two degrees to 76°F (24°C). In November, the weather continues to cool quickly. The average high and average low temperatures range between 80°F (27°C) and 72°F (22°C) for the last of Key West’s autumn months. December marks the beginning of winter and is the third coldest month of the year after February. The average high temperature rests at 76°F (24°C) while the average low temperature is 67°F (19°C). The best time to visit Florida’s theme parks and other attractions is right after the Christmas vacation in February as there much less crowds and great deals to be had. To enjoy the Florida Keys, Ft. Lauderdale, South Beach and the Everglades, the best time to visit to avoid the crowds is to come between June and August. Beaches are at their best between June and August while it’s best to head to Key West in January and May. There are several ways to get to Key West. 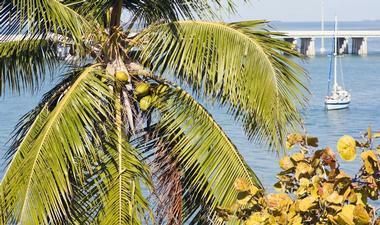 Several airlines fly to the Key West International Airport: there are non-stop flights from Miami to Key West. 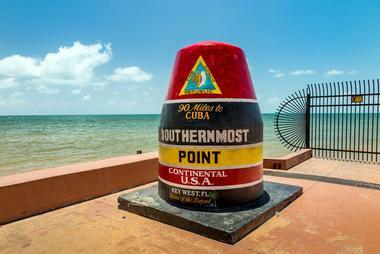 Many people choose to drive from the Miami area to Key West because of the scenery. The highway connects island to island all the way to Key West. Traffic can be heavy sometimes, but the scenery makes up for any traffic problems. If you don’t want to drive you can arrive by bus. Greyhound runs buses between Miami and Key West every day. The ride takes about 4 1/2 hours: it is a popular way to get to Key West so come early to get a seat. Key West offers several ways for visitors to get information about the town. The Key West Chamber of Commerce on Wall Street helps visitors with a variety of things like accommodations, attractions, restaurants, shopping, and how to get around the town. Another good source is the Key West Visitor Center on Roosevelt Boulevard. This organization helps visitors with the same kinds of questions: it also offers discounts on accommodations and water sports activities as well as free maps, coupons, and other information. Visitors should try to get a copy of Sharon Well’s “Walking and Biking Guide to Historic Key West.” This guide is interesting and very helpful. Key West is four miles long and just a bit more than one mile wide. It is very easy for visitors to get around Key West on foot, especially the Old Town located on the western side of the island. Old Town is where most hotels and attractions are located. Mopeds are popular but since there are no helmet laws, many people ride without wearing helmets. Bicycles are also popular and probably a little safer. They can usually be rented at the same shops where mopeds are rented. Whether you choose a moped or bicycle, wear a helmet. There is a small bus system that travels around the island. Key West is not a big town, but if offers a wide range of dining options. There are upscale restaurants in Key West: these include Blue Heaven which serves seafood and Caribbean cuisine; Cafe Marquesa offering contemporary American fare; Louie’s Backyard serving Caribbean fare; and Square One which offers New American/Fusion food. For lighter quicker meals there are plenty of fast food places mostly on Roosevelt Boulevard and Duval Street, the main street on Key West. Since the island is easy to get around by foot, visitors can walk from one restaurant to the next perusing the menus. Old Town and Bahama Village are two good places to do this. 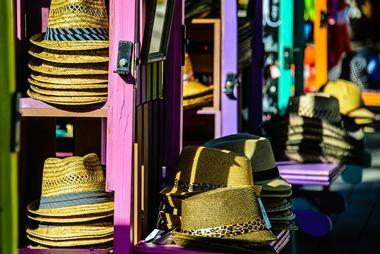 Key West is home to lots of small shops, many of them selling souvenirs from T-shirts to Key lime pies. In fact, there are more shops selling T-shirts on Duval Street than any other kind of souvenir. Clinton Street Market is located at the popular Mallory Square where visitors gather every evening to watch the sunset. This is an air-conditioned mall full of stalls and kiosks selling souvenirs, hats, shoes, candy, coffee, and much more. Art lovers can explore the many art galleries scattered here and there on Duval Street. This is a good place to find local or Caribbean works of art. Although small, Key West is made up of several neighborhoods. The most well-known is historic Old Town located on the western half of the island. This is the area where the first docks and warehouses were built in the late 1800s. 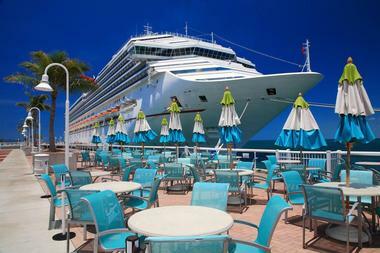 Here are most of the hotels, restaurants, and attractions including the beaches of Fort Zachary Taylor and Mallory Square. Just east of Duval Street is Bahama Village, a small community that has not changed much over the years: there are lizards and chickens that walk around freely. Upper Duval - Uptown is a district with boutiques, galleries, and restaurants. The eastern part of the island is mostly residential. With its beautiful turquoise water and unique historic charm, Key West is a popular place for weddings. 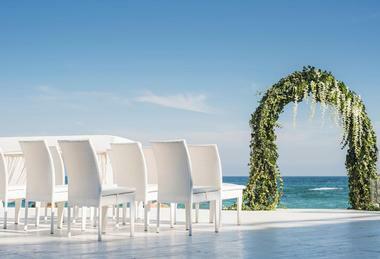 Even though it is a small island, it offers a wide range of venues for weddings. Some of the hotel and resort venues include the Southernmost Beach Resort, the Westin Key West Resort and Marina, Doubletree by Hilton Grand Key Resort, and the Hyatt Key West Resort and Marina. For outdoor weddings, a popular choice is the Key West Garden Club at the Historic West Martello Tower with its ocean views and romantic gazebo. 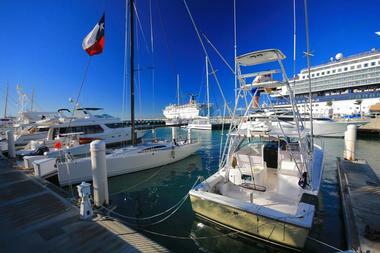 If you are interested in getting married at sea, consider the Classic Harbor Line Key West with its 105 foot yacht. 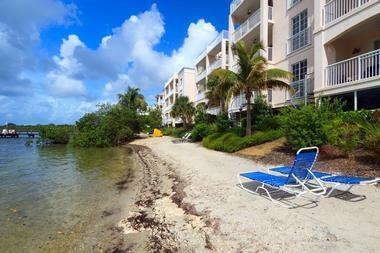 There are accommodations in Key West to suit every visitor’s needs and wants. There are luxury properties such as the Marquesa Hotel, the Sunset Key Guest Cottages, the Santa Maria Suites Resort, the Pier House Resort and Spa, and the Gardens Hotel. There are more modest properties such as Alexander’s Guesthouse, Curry Mansion Inn, Key Lime Inn, Seascape Inn, the Southernmost Point Guest House, the Gardens Hotel and Cottages, the Grand Guesthouse, and Weatherstation Inn. There are several campgrounds and RV parks in Key West for those who enjoy being close to nature. Vacation rentals are also a popular way to go: there are both houses and condos for rent.